The object of the game is to go around a space port collecting other aliens’ garbage, with aim of eventually getting out of dodge and creating a new life for yourself somewhere else. One that, ideally, doesn’t revolve around picking up trash. You can do things like choose your preferred goddess, chat with the locals, and of course, try to keep the place clean. Anyone who’s ever worked a dead-end job knows they’re great for people watching. The minutes creep by as you do the same set of tasks over and over again, with nothing better to do than study the faces around you and imagine the strange, idiosyncratic little lives they’ll be returning to when they leave. 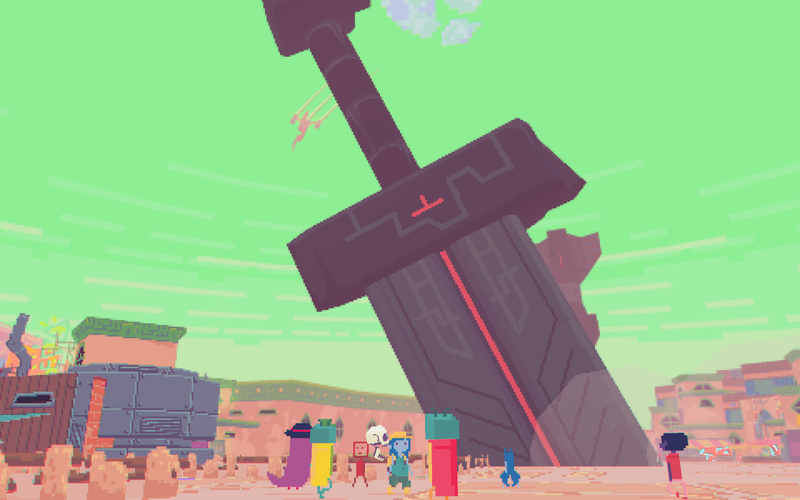 Diaries of A Spaceport Janitor has strange mysteries, and tons of things to buy, including everything from jewelry to drugs, but it’s bustle of the spaceport, the way it keeps busy without anything every seeming to change, that won me over. The days come and go, you wake up, go to sleep, and wake up again, each time hoping you were able to scrounge together a little more cash than you had before. It’s like Sundae Month, the game’s developer, took the low-res hub of an ancient, abandoned sci-fi MMO and than dropped you into the middle of it, not as a wandering hero but rather one of the NPCs people often ignore on their way from one important quest to another.